One helpful practice in meditative prayer is to imagine yourself in a Gospel scene. This practice helps you to understand what the story has to teach you. The Gospel for this Sunday (10th Sunday in Ordinary Time) is a great one for that. Luke provides evocative details that allow you to picture the scene. Jesus is journeying to a village with his disciples and a large crowd following him. You can picture them walking along, spirits high, eyes riveted on the Son of God. You can easily imagine the meeting of these two crowds at the gate. Suddenly, the followers of Jesus grow quiet, respectful of the dead. The funeral possession of mourners, filled with pity and respect for the widow, looks up with surprise to see another crowd on the road. The sound of weeping fills the air. Jesus approaches the widow. “Do not weep,” he says. That is very strange advice at a Semitic funeral, where public weeping is a cleansing act. 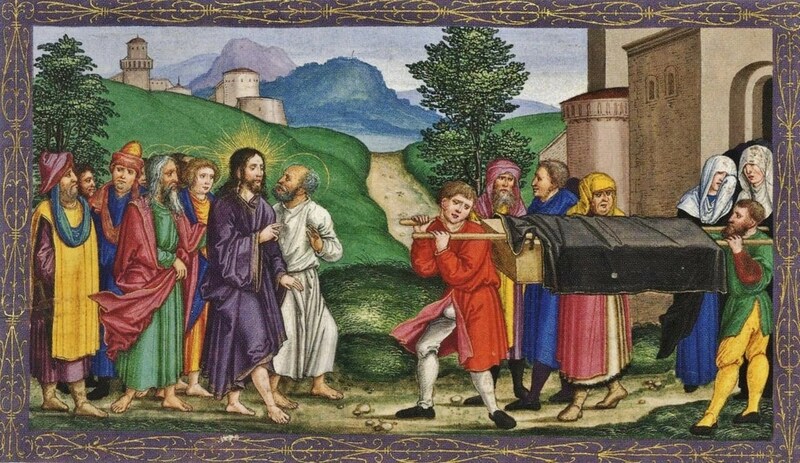 A follower of Jesus, having been electrified by his Sermon on the Mount, might also note that this is a departure from Jesus’ previous advice: “Blessed are they who mourn.” The strange advice is accompanied by a strange action: Jesus approaches the coffin and touches it — a shocking gesture. Contact with the dead makes you unclean, according to the Law. This is something you must not do. The two crowds would have had different reactions to it. Those following Jesus would see it as a sign that this man really was special; the normal rules don’t apply to him. Those following the coffin would be riveted, wondering what could possibly be going on. Everyone would have heard Jesus as he said, “Young man, I tell you, arise!” Luke calls Jesus “the Lord” in this passage. That is the euphemism used in the Old Testament because the reader does not dare pronounce the name of God. It fits especially here, where Jesus shows his power over life and death. The young man immediately sits up and begins to speak. It would be fascinating to know what he said. The Gospel only says that “Jesus gave him to his mother.” We can picture that strange but beautiful reunion, too. Consider the two crowds further. In the culture of the time, the whole event would have reminded the viewers of our first reading, in which Elijah raised a widow’s son. Elijah was famous for doing battle with the prophets of Baal. That battle is between the way of life and the way of death. And the two crowds in the Gospel illustrate the same: One was following an extraordinary, life-giving young man; the other was following a dead young man. In our day, these two crowds are still meeting — the culture of death and the culture of life. It is good to remember that we walk behind the man who is the gateway to eternal life.